Even though I respect your position I think you are crazy. People have different opinions and emotions can run deep when a person feels that what they believe in is being attacked. Whether it be your favorite sports team or your stance on political issues people passionately defend their choices. I have to admit I am no different, so knowing I might disenfranchise a certain segment of the population I will weigh in, in more ways than one, on a subject that divides many people. Since I have years of firsthand experience I am confident that my position is the only rational and right position on this subject but I fully realize that others may not agree even though they are on the wrong side of this meaty issue. I am speaking about the great BBQ debate. For those that are not knowledgeable in such important issues, there are several distinct styles of BBQ. Memphis, served with a tangy, thin tomato-based sauce; North Carolina, emphasis on pork and served with a ketchup-based sauce; South Carolina, where the sauce is usually mustard-based; Kansas City, where the sauce tastes of vinegar and paprika; Texas, which is all about the meat and sauce is served on the side and Alabama which takes a little from everyone except their white sauce which is a mixture of mayonnaise-and-vinegar. 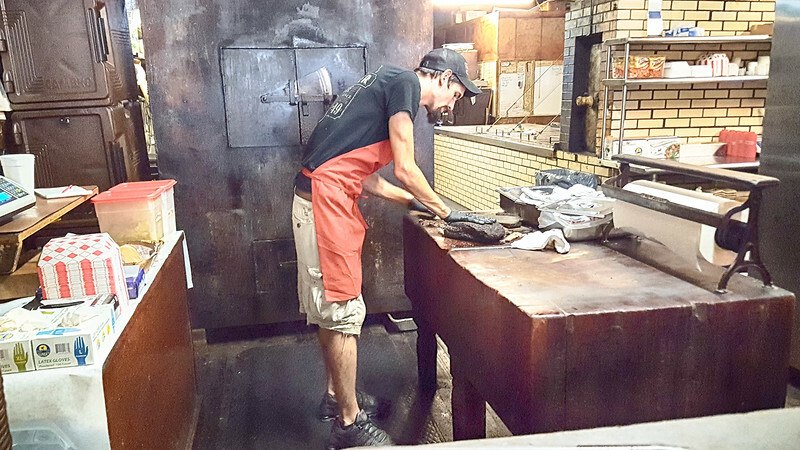 For this most important topic we look at two of the kings of BBQ, Arthur Bryant’s in Kansas City, Missouri and Louie Mueller in Taylor Texas. Both are revered, loved and have loyal followings. If you watch any of the food networks or travel shows that talk about food you have probably heard of Arthur Bryant’s BBQ in Kansas City. 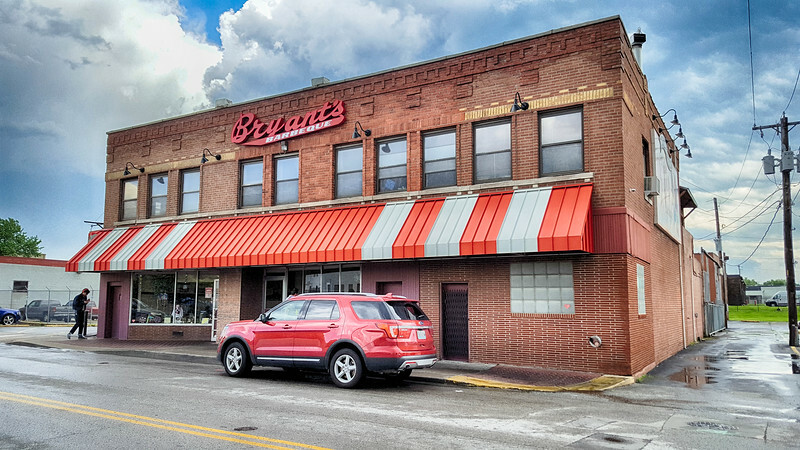 An institution since the 1920’s, Arthur Bryant learned the trade from another BBQ legend Henry Perry known as the “Father of Kansas City BBQ”. During a trip I decided to stop at the mecca of Kansas City BBQ and indulge myself to see if all the hype was true about the BBQ legend. I arrived at the restaurant a little after noon as a bus full of people was leaving. Thinking I would be in for a long wait, I stepped inside. The restaurant with formica tables and fluorescent lighting, is fairly small with two dining areas but there are a lot of tables so they accommodate a fairly large amount of people. The place was crowded but there were still enough places to sit. There were probably eight or nine people in line waiting to order. The line takes you to an enclosed kitchen where you place your order through windows and an assembly line of servers begin plating up your order. After looking over the menu I decide on trying the brisket and burnt ends, which Arthur Bryant is famous for. For the BBQ novice, burnt ends are the flavorful pieces of meat cut from the point half of a smoked brisket. They are not burnt but due to the higher fat content of the brisket point, it takes longer to fully cook until tender and render out the fat. Being my first visit, and mindful of the growing line behind me, thoughts of Seinfeld flashed in my mind where Jerry and George nervously approach the counter of the Soup Nazi and attempt to not screw up the proper way of ordering. I notice, with some surprise, the server behind the counter taking a good looking brisket and putting it on a commercial meat slicer. To my horror my lunch is unceremoniously sliced deli thin as if I was ordering a corned beef sandwich. 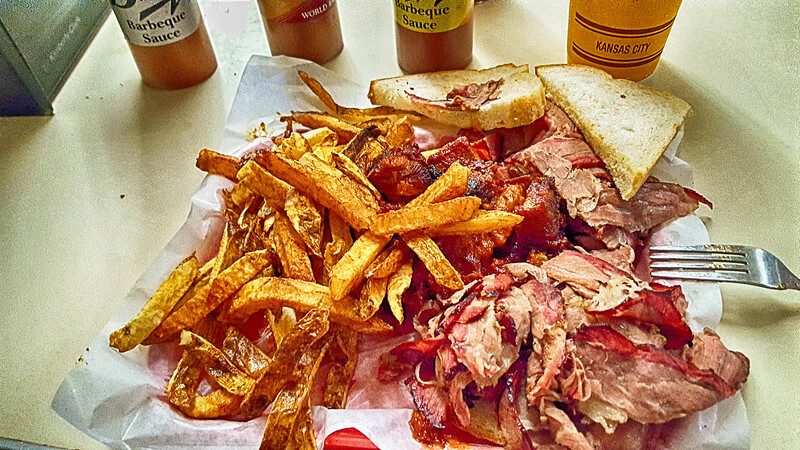 Piled high with thin slices of brisket I see my plate disappear behind the line to re emerge with a helping of burnt ends covered in BBQ sauce and a mound of french fries, served on a butcher paper covered tray with two slices of bread. Though initially disappointed at what I see before me I resolve myself to forge ahead looking forward to tasting what has been described as some of the best BBQ in the United States. While the brisket had some flavor I was disappointed in the paper thin slices and I am pretty sure that affected the taste since it was more like a packaged grocery store sandwich meat than smoked brisket. I was also highly disappointed in the burnt ends. Apparently after being cut the ends are put into BBQ sauce to sit until served since I found them mushy and not resembling any BBQ meat I had ever eaten. Instead of having the taste and texture of a finely smoked brisket all I tasted was a soggy piece of meat drenched in BBQ sauce. Now I know people get used to a certain taste based on what they grew up with but I have eaten BBQ all over the United States and this was mediocre. I have even eaten American style BBQ in Thailand at two different places and both were better than what I experienced at Arthur Bryant’s. 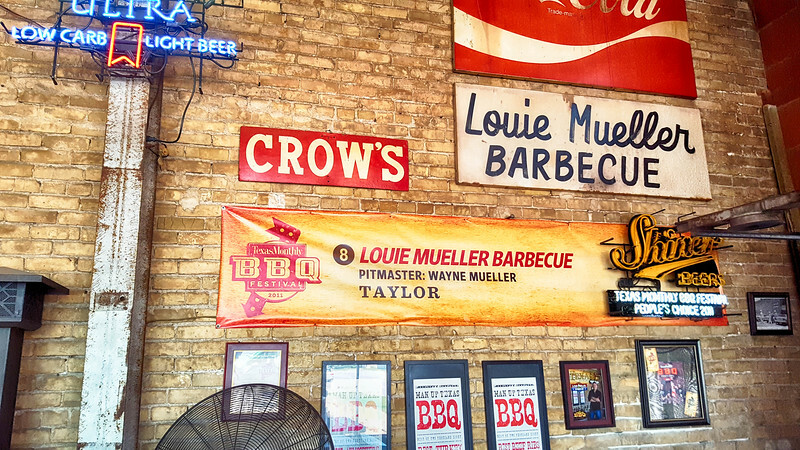 In contrast I recently visited Louie Mueller BBQ in Taylor Texas. 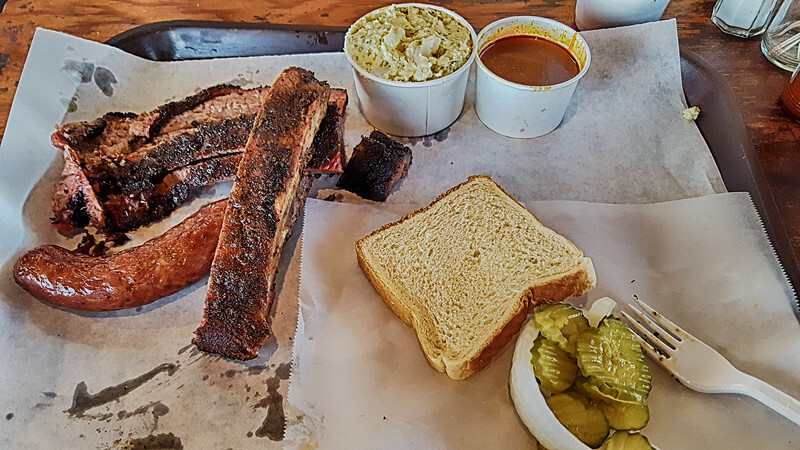 Texas has its share of famous BBQ joints; notice they are not called restaurants. From City Market in Luling, Snow’s in Lexington, the Salt Lick in Driftwood and Black’s in Lockhart, BBQ in Texas is an institution. 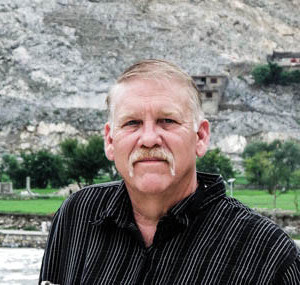 There is one king of Texas BBQ, a man that a lot of great pit masters give credit to and a place that has spawned two pit masters that have gone on to BBQ greatness. 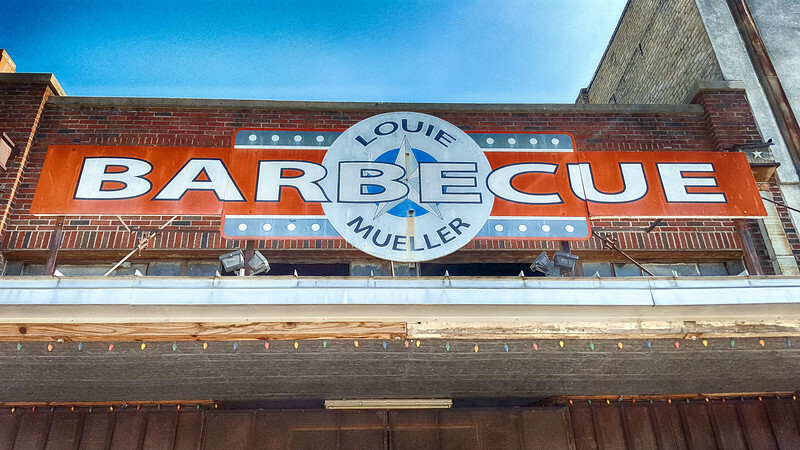 Both Aaron Franklin and John Mueller, grandson of the great Louie Mueller, operate their own places and have routinely been named in the top places for BBQ not only in Texas but in the US. In fact, Louie’s granddaughter LeAnn also has a BBQ joint while brother Wayne Mueller is the current pit master at Louie Mueller BBQ. Since 1949 people have made the trip to this town with a population a little over 16,000 and 35 miles from Austin, to visit the hallowed halls of BBQ goodness. Hey I know I might be a little biased but not too many BBQ joints have been in five movies and documentaries, featured on food shows and also a James Beard award winner. I arrived early and was the second person in the door when they opened at 11:00 am. 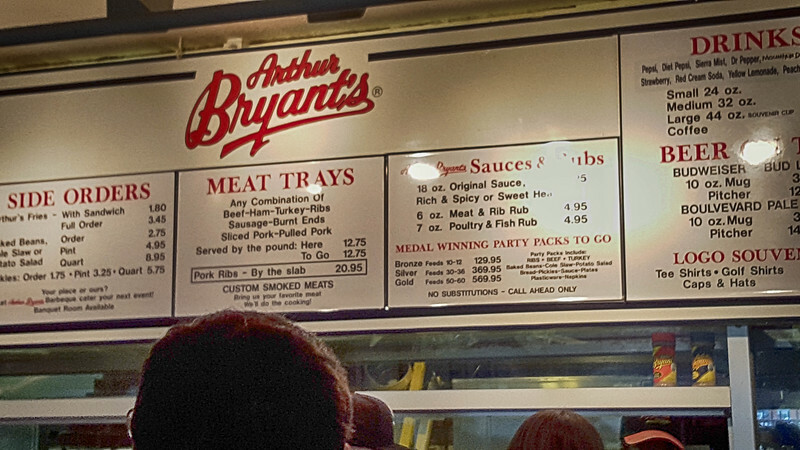 Unlike Arthur Bryant’s, when you walk up to the counter and order everything is open, you can see the pits and everything in the kitchen while you watch them slice up your food the old fashion way with a sharp knife. Unlike the assembly line I experienced earlier, there is one man behind the counter that slices up whatever you order, when you order it, taking the meat from the pit just before being served. In order to perform my due diligence, I had to put myself on the line and order a sampler of what they had to offer. My order of a couple of slices of smoked brisket, one rib and a link of sausage arrived on butcher paper along with a slice of white bread, pickles and a couple of slices of onion. I also added a side of potato salad and received a side of BBQ sauce. 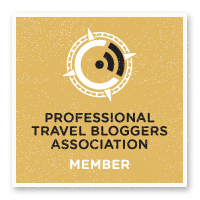 A rush of excitement I had not experienced since the first time I received an upgrade to first class on the airlines came over me as I watched while the man behind the counter sliced and put a complimentary burnt end on my tray. I quickly realized I wasn’t special as he did this with everyone but still it was my moment, don’t ruin it. As I sat down in anticipation, hoping not to be disappointed, I looked at my bounty like a kid receiving a Christmas present. My first bite was of course the burnt end. A smoky, tender, delicious morsel of meat with just the right amount of pepper. Seldom does a bite of food make your mouth water during and after you eat it but this did. As I took my first bite of properly smoked thick sliced brisket with a substantial smoke ring, my mouth was engulfed with smoky, meaty goodness. It must have been obvious I was having a moment as others looked on while I relaxed in my chair and stared at the marvel in front of me. Next I took a bite from the rib which had just enough pull from the bone to know it was cooked properly and then next came the sausage, all beef, made by hand and stuffed in natural hog casing. This was BBQ. My faith in the BBQ gods was restored. This was true Texas BBQ that needed nothing added to it, the meat was the star. It was not drenched in sauce nor served from a warming tray that had sit under warming lights. This was made the same way Louie Mueller had done when he first started. Sprinkled with nothing but salt and pepper and slow smoked over post oak wood until the meat is tender enough to pull apart with your fingers. I now understood why Louie Mueller had inspired such BBQ legends and why it was called “the epitome” of Texas BBQ by the New York Times. While the amount of food ordered was comparable to Arthur Bryant’s the cost was roughly twice as much. I guess the saying is true, you get what you pay for. My only regret was not ordering the homemade peach cobbler, a legend in its own right. But after slowly devouring what I have to say is the best BBQ I have ever eaten I was properly stuffed like the sausage. Anytime BBQ is good enough to put a smile on a PETA members face and make a vegetarian break out into a cold sweat like a junkie needing a fix, you know it is good. While I respect your passion for your beloved Kansas City BBQ, I can only believe it’s not your fault for being deprived of truly remarkable BBQ. Feel free to weigh in on your favorite BBQ place and let the hate mail from Kansas City begin. Wow a lot of preparation goes into this bbq in the USA. In Australia, you just slap a snag on bbq and away you go lol. The food looks amazing. Not sure what a snag is, but bring it over we will kill it and grill it. Once you try good Texas BBQ you will be spoiled. BBQ of the Carolinas is where it’s at. Granted, I too respect your totally incorrect opinion, but there’s just something about the Texan style that I don’t dig on. Maybe it’s the fact that, like with pico or guac, the point of the food is the sauce, not the underlayer it’s served on, even if it’s stellar meat. If BBQ sauces were soups that were acceptable to eat on their own I’d be in heaven. Both places looked good to me. However, it’s nice to have your opinions about these two places. It is always nice to try out different places like that. Of course, I have a few BBQ houses around me that I like too. After traveling and working around the world I have witnessed how people around different regions have their take on certain foods. I usually enjoy eating foods from wherever I am but for some reason there are certain things that no matter how hard I try, I compare to what I grew up with and knew, BBQ for one. I have had very good BBQ, even some covered in sauce, but I just wasn’t a fan of this Kansas City restaurant. But hey, they are doing something right. They have been open since the 1920’s and always have a full house. Don’t get me started on the great “beans or no beans” chili debate. Absolutely, no reason to mask good smoked meat by putting sauce on it. Well, to be honest, since I am vegan, don’t really relate to what could have been right or wrong. With us, things are a lot simpler. Both these places appealed to the vegan part of me. Appealed to the vegan part of you? Do we have a convert? I loved the smells of BBQ when my dad used to do it in the backyard. Haven’t had a good BBQ in years!!! I didn’t know there were so many types! Everyone has their favorite style. Heck if you get 4 guys in a backyard with 1 grill or smoker each one will know how to make BBQ better than the other one. Ha, Ha! The title really sucked me in! I couldn’t believe you were going into the realm of politics, but then it all came clear. Fun read, even though meat is not my thing. Politics, Shmolitics. Nothing evokes a bigger debate among BBQ lovers than what region is the only real BBQ. Of course we in Texas know the truth. Well, I have to say, we don’t have very many BBQ joints in Vermont, but there is one that is famous at least in New England, and that’s Curtis BBQ in Putney (if you’re ever up this way). Curtis lives in Vermont only in the summer and he has a pet pig who sleeps right next to the BBQ pit. Love your writing style! I could never be a food critic! I haven’t met Curtis but I already like him. The sacrifices we undertake in the name of research. This was a cruel cruel story. I’m stuck in NYC and not able to run out and taste any sort of delicious BBQ right this moment! One day, my family and I plan to do a BBQ road trip and will then be able to weigh in. Although, I agree with the paper thin sliced brisket, a bit strange. Regardless, my stomach still growled and am drooling. Wow, I never realised that the subject of BBQ could be so complex :). I guess I really need to visit the States. 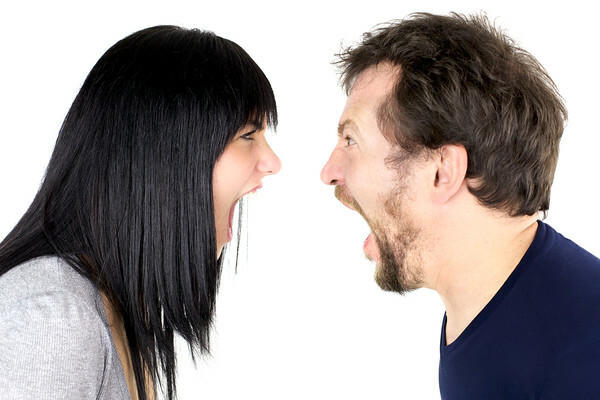 It evokes a lot of passion, debate and a few fist fights. Yum! It’s funny you say that in Texas a BBQ is an institution – not a restaurant, not a diner, a barbecue – because it’s the same here in South America. In Brazil and Argentina it’s simply a churrascaria. In fact last night we had BBQ in Colombia and it was mouthwatering. Love me a goof barbecue! And I’m definitely down to visit Texas just for the food! I think the origins are similar, old cowboys and gauchos having to learn how to take a tough piece of meat and make it taste good. I love BBQ and am thrilled to head back to BBQ country this fall. Going to Austin and will have to see if I can get my hand on a car to make it out to Louie Mueller BBQ. I’ve visited Saltlick before but it would be fun to try something new. Not too far from Austin it would be a nice day trip. head to Louie Mueller then hit Georgetown on the way back. I always known that USA is pretty big on BBQs but of course there’s always a lot of debate who makes it best. I’m not exactly sure what to say but damn, I seriously need to taste them good looking charred meat! You might be surprised. Several years ago you need to go to the source for good BBQ or Pizza or whatever. These days you can find Chicago deep dish pizza in New Orleans, Texas BBQ in Seattle and Philly Cheese steaks in California. With the popularity of food shows and people who have relocated to other areas opening up restaurants that reflect the food they grew up with you can find some good spots. Thought I have to agree there is no substitute for the original. I saw this a couple of hours ago but have been dealing with chest pains when you said London had good BBQ not to mention the sauce. That’s like a Texan saying they fry up some good fish and chips. 🙂 just kidding I have had some decent BBQ in places I would not imagine but don’t tell the Texas Governor, I might get my Texan citizenship revoked.